Fish Extender gifts are a Disney Cruise gift exchange. Here are some frequently asked questions about FE exchange and the answers. 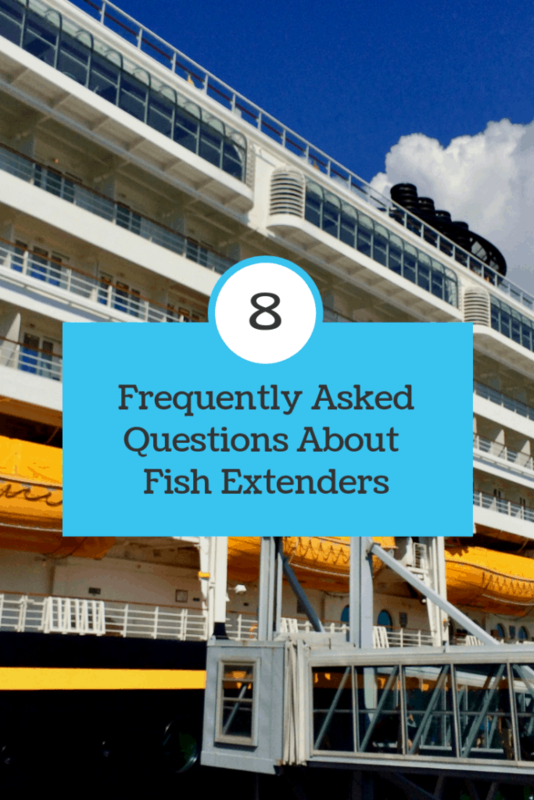 How do you I join a Fish Extender (FE) Group for my cruise? The easiest way to join an FE group is to join the Facebook cruise group for your date. Cruise groups organize the FE exchange for your sail date. How do you find your cruise group? Join a Facebook group that lists cruise groups for each sailing. .You can also search for a cruise group using Facebook search. Search using the name of your ship and the date of your cruise, e.g., “Disney Magic August 25, 2019”. If there is a group, it should appear at the top of the list. You may need to look under the Groups tab to find the cruise group. Still not finding your group? There may not be a group started yet. Why not start one yourself? You can also check out the Disboards to find a cruise group for your sailing. Who do I give a gift to? Your FE group coordinator will provide you with a list of participating cabins in your FE group. Most groups are made up of 10 – 12 cabins. You can choose to give a gift for the whole cabin or give individual gifts to each member of the cabin. 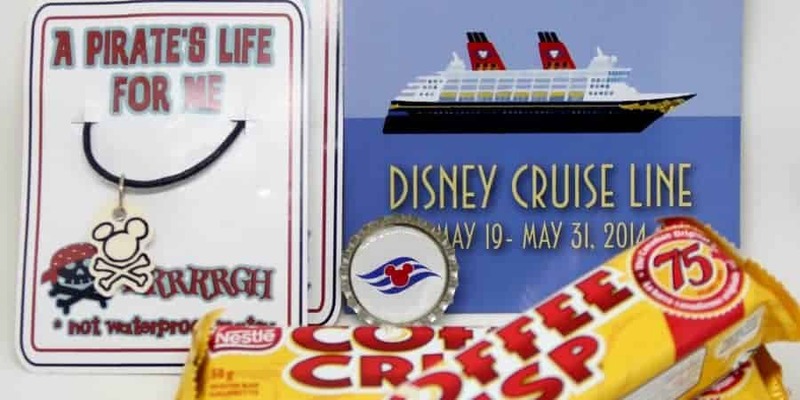 I usually give one cabin gift that has something small for each person in the cabin, such as a magnet of their favourite character, an individual chocolate bar, or a pirate necklace. Do I give a gift everyday? No, you give one gift per cabin or person for the duration of the cruise. When do I deliver my gifts? You can give your gifts whenever you like. Most people give their gifts out early on the cruise—often on a sea day. Don’t wait until the last day to give out your gifts. That way the recipients will have time to pack your gift. How much do I need to spend on my gifts? Give what you can afford. I think the key to giving FE gifts is to give something that you would appreciate receiving. Something cruise related is always good: a personalized magnet, a laundry kit, or a first aid kit can all be very reasonably priced. The key is to put some thought into it. What is the best way to deliver our gifts? My strategy for handing out our gifts—including all exchanges: FE, magnet, recipe, candy, and ornaments—is to divide the gifts by deck and try and sort them by port vs. starboard forward to aft. This way I can start at the front of the ship go down one side’s corridor and back up the other side’s corridor. I end up back at the front of the ship and I can go down to the next deck and repeat the process. Sometimes I will only deliver to a couple of decks when I am on my way somewhere, breaking up the amount of time it takes to deliver. What is the difference between an FE gift and Pixie Dust gift? An FE gift is for an organized gift exchange set-up in your cruise group. Pixie Dust is something that you gift anyone, no need to join an FE exchange or cruise group. Examples of Pixie Dusting are an extra magnet to put on someone’s door, crayon kit for the table next to you, or some glow sticks to hand out on Pirate Night. Do I need to label my gifts? No, you don’t need to label your gifts, but it is nice to let people know who the gift came from. Check back later this week I am going to post a file that you can print and use to label your FE gifts. Are there any questions I missed? Let me know in the comments. Check out my room tours of the secret porthole rooms 5520 and 6006. Don’t miss my latest trip report from our London and westbound transatlantic cruise on the Disney Magic. Check out my six essential items to pack on a Disney Cruise.